Technology firms will ultimately prevail in their efforts to use strong encryption on devices that cannot be accessed by the government, Google executive chairman Eric Schmidt said Wednesday. Schmidt, speaking at a Washington think-tank, said he was "sympathetic" to the arguments of law enforcement and intelligence agencies seeking to thwart crime and terrorism, but that it is not feasible to create access only for "the good guys." 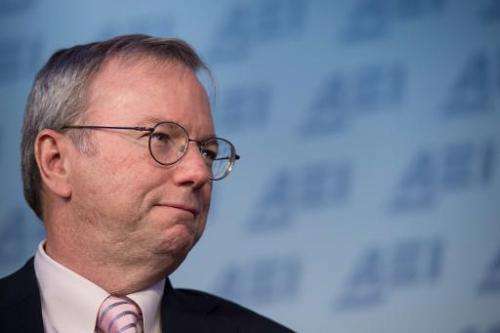 "We don't know how to build a trap door in these systems which is only available to the good guys," the Google chief said at a forum at the American Enterprise Institute. "If we put a trap door in our system, first, we would have to disclose it because people would find out anyway. And second, some evil person in addition to the good guys would figure out a way to get in." Schmidt's comments come after the heads of the FBI and National Security Agency complained that encryption on devices being implemented by Google, Apple and others is hurting their ability to track down criminals and terrorists. The Google chief said however that allowing special access would be tantamount to a system allowing the government "to watch what everyone is doing in order to figure out who the bad guys are." "We've taken a very tough line in the industry over this issue and I think we will win this one, at least in America," Schmidt said. Last month, NSA chief Michael Rogers said he hoped to see a compromise which allows intelligence services to snoop on encrypted devices to combat terrorism, within a "legal framework" to protect user rights. FBI chief James Comey similarly warned that encryption could hurt crime-fighting. Schmidt said Wednesday that the disclosures in documents leaked by former NSA contractor Edward Snowden showed intelligence services have been too broad in their surveillance. "The government says they would keep metadata records of 300 million Americans in order to identify 50 potential terrorist targets, and identify one who turned out not to be a terrorist," he said. He said Google has always cooperated with legal requests for information, but added that "we say we want you to come through the front door and we put in encryption so you don't come in through the back door." On a separate issue, Schmidt said US policy on immigration was "stupid" and keeping away people with needed technology skills. "In the long list of stupid policies of the US government, our attitude toward immigration has got to be near the top," he said during the forum. Schmidt said there is a consensus on the need to increase the number of highly skilled immigrants—under a visa program known as H1-B—but that reform efforts are held up by a lack of agreement on broader immigration issues. "We take very, very smart people, bring them into the country, give them a diploma and kick them out where they go and create companies that compete with us," he said. "Everyone actually agrees there should more H1-B visas ... The effect of this is that you can never get a political solution because that's seen as a good thing, and all of the other political issues surrounding immigration are difficult." Asked about "net neutrality" rules being implement by a US agency to protect against a "two-speed" Internet, Schmidt did not directly address the issue but sounded a negative note. Schmidt maintained that "the best way to have net neutrality.. is to have competition" but stopped short of commenting on the rules voted last month by the Federal Communications Commission. "I'm generally in favor of less regulation, no matter what, on the Internet," he said. "It's so difficult to predict how quickly this thing moves. and many of the problems that people have can be simply solved by technology that people are inventing." As an example, he said several years ago there were calls for regulation to control email "spam" but that new technologies have greatly reduced that problem.